Salmons never disappoint especially when you are looking for a tasty food. The other advantage is that salmon goes with everything and you can as well spice it. There are several claims that salmon is also one of the healthiest foods that are available today with the main reason being it is packed with omega-3 fats. If you are looking on the best and mouthwatering, healthy salmon recipes, then you are at the right place. Here we discuss three of the easiest salmon cream cheese recipes to make it easy for you. However, before we jump to the three recipes, there’s something I want to make clear on the salmon you should go for. As a matter of fact, almost all the salmon sourced from the Atlantic is farmed. There are several reasons why people go for farmed salmon which are: farmed salmon are very affordable, widely available and delicious. However, it is known for its lowest quality. As a matter of fact, these salmons are farmed in small spaces and they are also fed a diet of protein pellets only. In most of the cases they are also given antibiotics to make sure they resist deceases. They are also injected with food coloring to give them the color and for these reasons; they are the lowest in quality. This is the healthiest salmon that you can get. However, they are very expensive and not really available. The main reason for this is that they naturally matured to adulthood in the wilderness at their own natural pace. They are not injected with colors or even limited in space. Additionally, the calorie and fat content is also lower in them than it is on farmed salmon. This is the main reason why most of the people are going for the wild salmon. There are different types of wild salmons that you can as well go for which includes sockeye, coho, pink salmon, chum and the king salmon. •	You may also need, fresh baby spinach, olive oil, salt and garlic powder. Now that you have all the ingredients that you need along the way, let’s get to the real deal here. Start by heating the oven to about 400 and later spray a 9X9 baking pan with Olive oil. After you are done doing the first two, you are later supposed to add salmon fillets in pan and eventually sprinkle with paprika. Get a small bowl and mix cream cheese, parsley and minced garlic and eventually a sprinkle of pepper. Ensure that this is spread over the salmon fillets. Although there’s no set rule as for how long you should microwave this, it is wise to microwave it to 30 seconds or less. You can microwave it until it is very easy to spread. Now get the chopped onions and sprinkle them over the cream cheese evenly. After this, just get spinach leaves and layer them neatly over the onions. You can make up to 4 layers of leaves. Spray olive oil over the spinach leaves and eventually do it lightly with garlic powder, pepper and salt. Now depending on the thickness of your salmon, you can leave it to settle for about 25-35 minutes after covering it with foil. It may take longer than usual especially because of the toppings. After you have left this to bake for this time, now you can get it and serve. Your food is ready and you can serve it to friends and family. This is one of the ways that most of the people like their bagels. It can be a good match for the breakfast. Here is how to go about it. You will need the below ingredients to prepare protein herb and garlic cream cheese. The process of preparing this recipe is very simple. The first step is to combine all the ingredients and put them on a bowl and mix well. After that chill in the fridge for at least 30 minutes and eventually serve your meal. Here is another recipe to impress everyone on your table. It a chance to make delicious and nutritious food that can substitute all your previous recipes. With all the above ingredients, you are now set to go. Make sure that your oven is preheated to about 350o before you continue. After that, place salmon in an ungreased baking pan. Now you are ready to spread sour cream over each fillet. You can now combine the remaining ingredients. 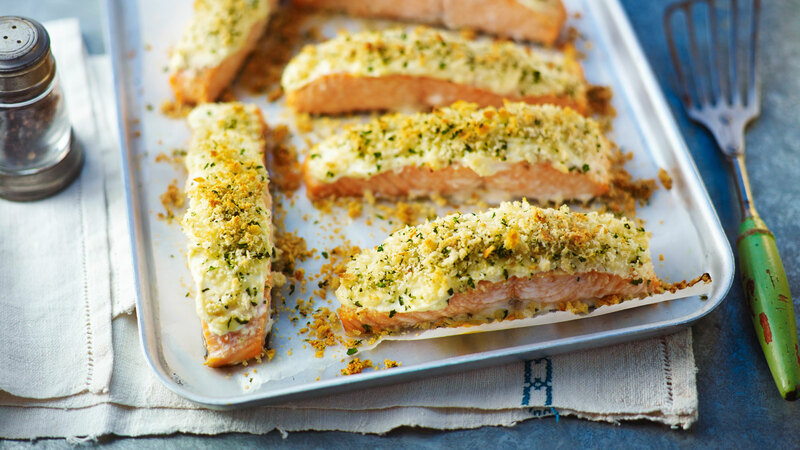 The next step is to pat crumb-nut mixture onto tops of salmon fillets. When you are doing this, you should be pressing to make sure the coating adhere. Just take some time to bake it until fish begins to flake easily. You can do this with a fork for about 15 minutes. Now you are ready to serve.